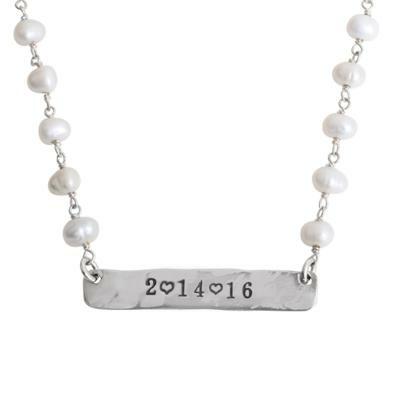 We love the look of this pearl necklace paired with a stamped silver plate customized with the word, name or date of your choosing! Customize the stamped silver bar with up to 8 characters. Pearls are one of our favorites - especially when they hold a delicate silver bar stamped with meaning. You can stamp your last name, blessed, family, love, a date ~ anything you want that is special to you! The pearls are wire wrapped in sterling silver chain and hold a silver bar that can be stamped with up to 8 characters using the block font. (More characters can fit if you want to use the Nelle or Lizzy font but you will need to call us to arrange that). Dimensions: All silver is sterling. Pearls are approximately 3-4mm. Silver stamped bar is approx. 1" x 1/4". I love this pearl necklace! It is the perfect size and has the pearls to add details. The stamping looks great! It's just what I've been looking for! I plan to order some Christmas gifts from Nellie and Lizzy. I purchased my necklaces during a sale and it was a wonderful treat for myself. I love that it has the 2 inch extender so it can be worn as an18 inch or 20 inch. Thank you Nellie and Lizzy! The necklaces surpassed my expectations and I love them. The pearl necklace is so charming and the monogram is simple and casual. I wear them all the time! They both seem well made and the clasps are great. I will definitely shop here again.